Lie back and relax with the Wild Rose Bath Cream, a natural, holistic treatment from health-based beauty brand Weleda. Transform your bath into a luxurious, pampering experience with this indulgent bath soak, formulated with a selection of exquisite essential oils and nourishing extracts. Delicate Damask Rose imbues a familiar, relaxing scent, while Olive and Jojoba Oils deeply moisturise skin for a sumptuously smooth texture. Emerge from the water with a sense of wellbeing and skin that feels soft, supple and radiant. Dermatologically tested. Free from synthetic preservatives, fragrances, colourants and raw materials derived from mineral oils. Add three or four capfuls to a warm bath and lie back to soak for 10-20 minutes. 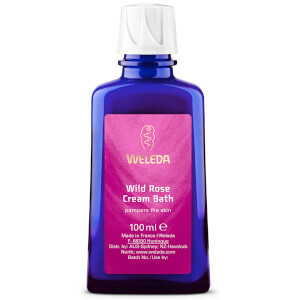 Create an even more pampering wash with Weleda Wild Rose Creamy Body Wash or Wild Rose Soap.